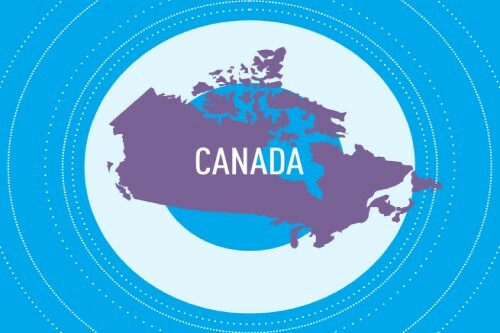 Canada is the second-largest country in the world. It has the longest coastline and borders three oceans: the Atlantic, the Pacific, and the Arctic. About 31% of the country is covered by forests. Interestingly, that 20% of all fresh water in the world is concentrated in Canada. There is no nation or territory in the world with more lakes. Canada is the birthplace of hockey. Canadians are wild about it! Regardless of their gender, age, or ethnicity, Canadians regularly attend hockey games to watch their favorite local and national teams. On game days fans drink an enormous amount of beer in bars, and sometimes they get into fights over whose athletic idols are the best. The ethnic makeup of the Canadian population is highly diverse. Only 30.9% of the population consider themselves Canadians, whereas 20.1% call themselves English and 15.1% – French. Canada is one of the ten most active countries in terms of trade. It primarily processes and exports natural resources, and a large portion of its exports is made up by agricultural products. Canada is also the world’s largest producer of zinc and uranium. The Canadian auto and aerospace industries are growing dynamically, as is the oil and gas industry. Analysts consider Canada to be one of the wealthiest nations, and they base this not only on absolute indicators. The average income per person in Canada is one of the highest in the world. In other words, Canada has developed a reputation as a socially prosperous country, and some experts consider Toronto to be the best city to live in on Earth. 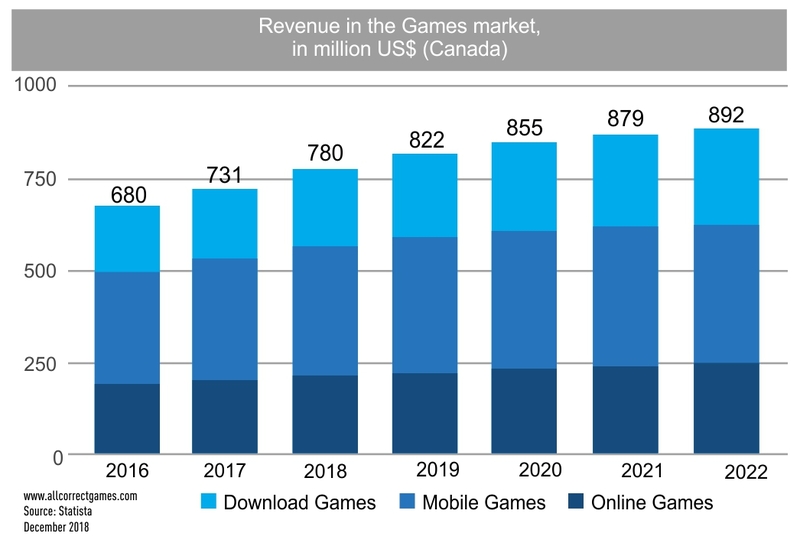 According to data from Statista, in 2018 the volume of the entire Canadian games market was USD 780 million. The portal’s analysts believe there to be 14.9 million active players in the country. 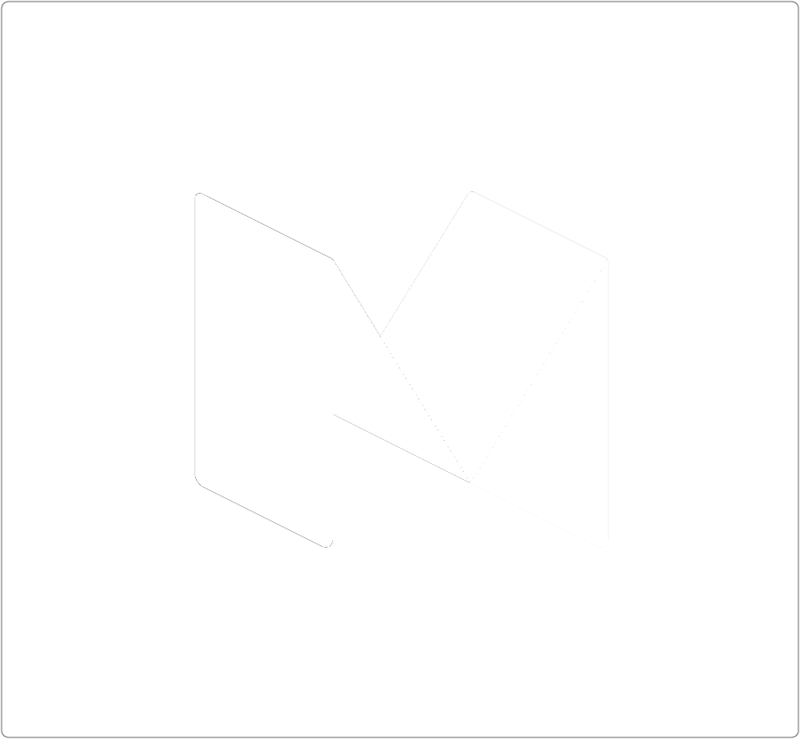 The numbers from the specialists at Newzoo are completely different: they believe that the volume of the market reached USD 2.3 million in 2018 and that there are 21.2 million active players in Canada. It’s difficult to say why the data from these two sources is so different. The dissimilarities in the indicators of these two analytical sources have been observed before, so we’re going to focus on the numbers from Statista just to be safe. However, we should remember that, as is often the case, the truth is probably somewhere in the middle. The volume of the market is predicted to reach USD 892 million by 2022. Canada is one of the few countries in the world where analysts are predicting a gradual decline in the mobile segment. 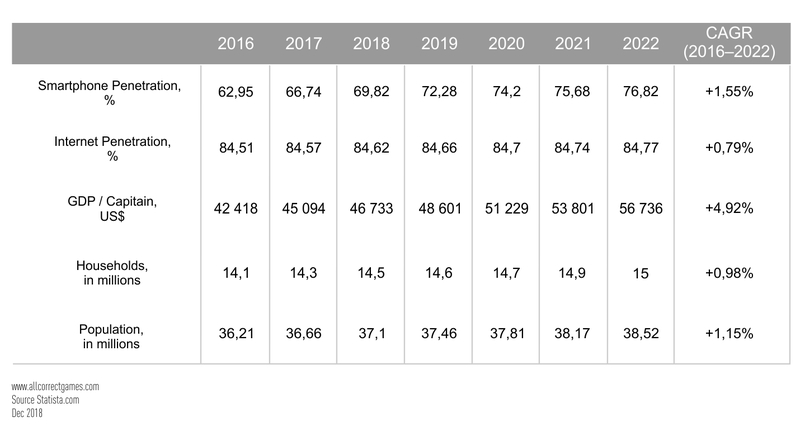 While it is currently growing by 6.5% per year, in 2022 the growth rate will become negative, and the market will shrink by 1.3% compared to 2021. As for the contemporary situation with games in Canada, mobile games are currently in the lead, with 45% of the entire market. Console and PC games are expected to snag 3% of the market by 2022. 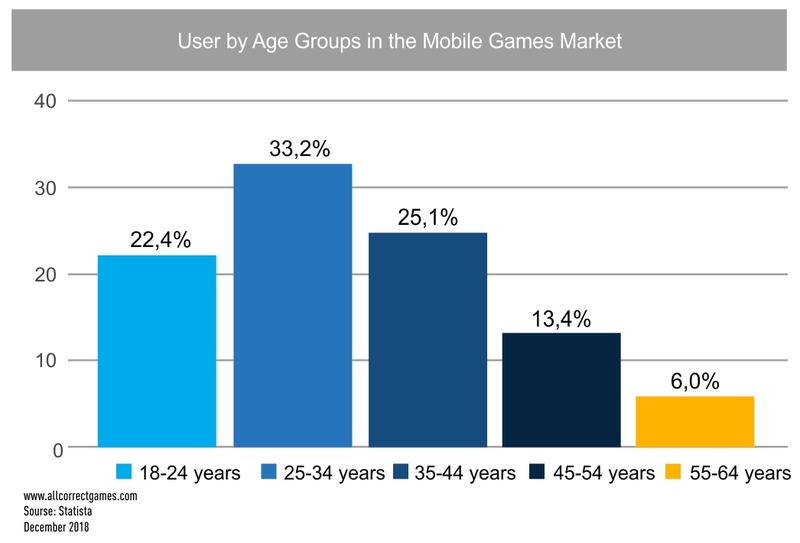 In general, the growth rate in the mobile games segment is clearly trending downward. The growth rate was 6.7% in 2018, and by 2022 this figure will drop by a factor of four to 1.6%. Despite this, the number of users is, surprisingly, expected to continue to grow. Where 14.9 million people spent time with games in 2018, by 2022 17.1 million people will be playing. The penetration of mobile games into Canadians’ daily lives should increase from 31.3% to 37.1%. As you might expect, the reduction in the growth rate of the mobile segment is connected to a drop in ARPU (average revenue per user). From 2016 to 2018, the average payment per player dropped from USD 30.97 to USD 30.63. Analysts predict that the situation will only get worse over the next four years, and by 2022 the ARPU in Canada is expected to reach USD 26.20. However, Canada remains a core market for testing new products prior to a large-scale release in the USA. According to data from Chartboost, the average cost to attract a player to an app is USD 0.86 for Android and USD 1.69 for iOS (twice as expensive). Since user metrics obtained from Canadians can be used to generate hypotheses about a project’s success on the American market, this isn’t a lot of money. 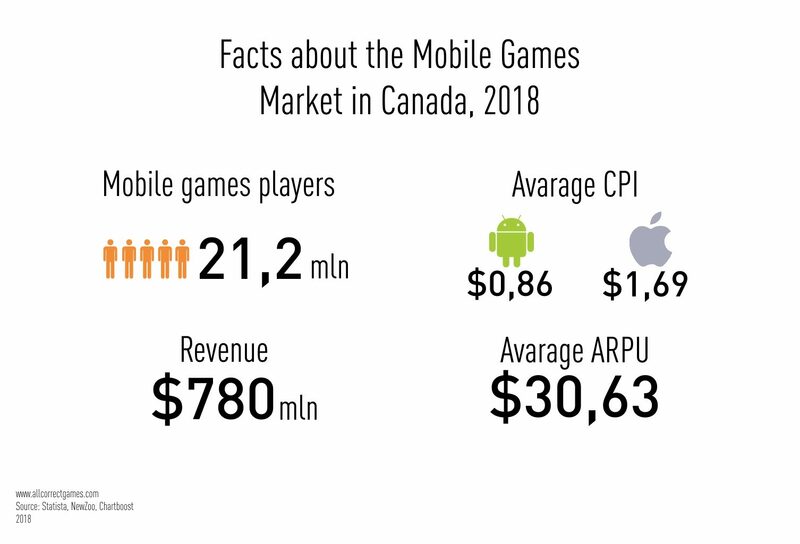 Who plays mobile games in Canada? According to Statista’s data for 2017, the majority of Canadian gamers are male. They represent 64.2% of all users. Females make up 35.8% of the audience. As in many countries, the largest segment of players is represented by people aged 25 to 34: 33.2%. The 35-44 age group is smaller, with 25.1%, and young people aged 18-24 constitute 22.4%. Players aged 45-54 make up 13.4% of the audience, and players over 55 comprise just 6%. Despite the fact that Canada has one of the highest standards of living in the world, game fans who rate their income as high make up just 37.6%. Another 32.2% of respondents said that they had an average income. And 30.2% of survey participants considered their income to be low. However, it is important to note that the concept of “low income” in Canada is very different from that in, say, Brazil. According to indicators for mid-November 2018, the most popular game on iOS was Candy Crush Saga, and, unsurprisingly, the crown for this segment on Android goes to Pokémon GO. When considering local tendencies, it’s important to note that one of the leading games is Slotomania. North American players are very loyal to the casino genre, and slot machine games are a common way to relax after a long day at work. They aren’t seen as something bad — players use these apps to spend money rather than to win it (unlike in CIS countries). 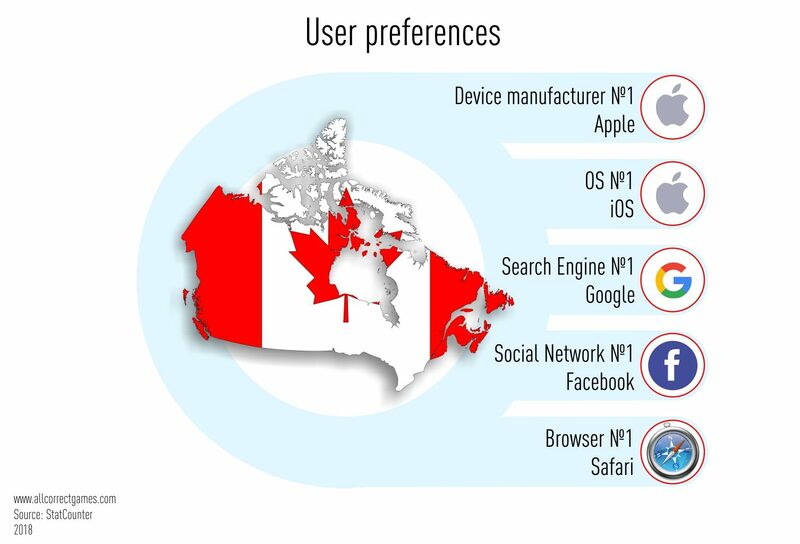 Furthermore, 53.5% of the Canadian market uses iOS devices, and 45.24% uses Android. The remaining players are so insignificant that they aren’t worth considering. Here’s a fact about popular smartphone brands: most Canadian users (53.3%) prefer Apple products. Samsung products come in second (26.61%), and LG devices come in third (5.6%). As for search engines, in Canada, as in the rest of the world, Google has a massive lead, with 93.09% of the market. However, a few people still use Bing (3.79%) and Yahoo! (2.24%). The three social networks with the largest number of users are Facebook (52.85%), Pinterest (31.63%), and Twitter (2.43%). Strikingly, according to Statcounter, only 1.75% of all Canadian mobile users use Instagram. It would be hard to overstate the contribution that Canadian developers have made to the game industry. If not for them, the world would never have known the Mass Effect trilogy, and GTA V might not have been such a masterpiece. Interestingly, in Canada, where French is one of the official languages, there are four offices of the French company Ubisoft. Canadian culture represents a surprising mix of the cultures of North America, France, and Great Britain. In 1971 multiculturalism was acknowledged as an official ideology of Canada, which has allowed people from many different countries to live here while preserving their national identities. It is therefore difficult to point out tendencies that are common to Canadians. There is one thing that unites them all: tolerance. When launching a new app on the Canadian market, it is important to carefully ensure that it does not offend any minority groups. It’s not a good idea to focus on them either, however. Canadians are less intense about these issues than Americans are. The Canadian government opposes gender stereotypes. Among other things, when filling out forms on government websites, in addition to the standard male and female options, there is now a third option: X.  This option is intended for transgender people and individuals with non-traditional gender identities. There is a widespread myth that in Canada parents can have a child taken away from them if they do not accept the child’s gender identity. As mentioned above, Canada is a multicultural country, and there’s nothing surprising about the fact that it has two national languages: English and French. They are the native languages of 67.1% and 21.5% of the population respectively. In addition, 17.5% of Canadians are bilingual, i.e. they are equally fluent in both languages. The country’s popular culture was, in many ways, formed under the influence of the USA. Canadians listen to the same music and watch the same TV shows as Americans, and they pay just as much attention to the battles in the American political arena as their southern neighbors. They have a similar mentality. This is precisely what makes Canada so attractive to software developers — it’s a great place to test products on “almost Americans” and identify all problem areas before an official release in the US. Canada is also a popular venue for a “soft launch” because this makes it possible to reduce expenses on promoting a game or an app. Here’s some more information about the official languages of Canada. English is the world’s lingua franca and an official language in many countries. There is no question that English is the most popular language online, and so language pairs involving English are the most in-demand in localization. France belongs to the Romance branch of the Indo-European language family. It is spoken by more than 130 million people around the world, and approximately 80 million people claim it as their mother tongue. It should also be noted that French is less tolerant of abbreviations and acronyms than other European languages.